One of the biggest concerns that pet owners face is keeping their pets safe. Pet fences can help to ensure that your pet stays safe from hazards in a contained area. Many dog owners use pet fences in their backyards to keep their dogs from running away. However, indoor and portable pet fences are also good for keeping small pets and cats in safe areas at home and while traveling. We reviewed dozens of pet fences to find the best of the best. We looked for pet fences that were safe, affordable, feature-driven, and portable. From all of the different models and specifications, we identified 5 of the best pet fences that you can buy. We’ve identified the MidWest Homes for Pets Foldable Metal Exercise Pen as the best pet fence for most pets. It’s an extremely affordable pet fence that is a popular choice of pet owners. It is available in five different heights, so you can pick the height that’s appropriate for your pet. It also folds flat, so you can easily store it when it isn’t in use. For an affordable and versatile pet fence, the MidWest Homes for Pets Foldable Metal Excercise Pen is a great choice for most pet owners. It costs somewhere between $30 and $80 depending on fence height, finish, and if it has a door. The taller models and those with a door cost more than the basic, black version. The fence is assembled with 4 thumb-snaps that make assembly quick and simple. You will be able to move the pet fence to where you need it. This pet fence consists of 8 separate panels that connect together without any tools to fence in 16 square feet. When not in use, you can fold the exercise pen flat for easier storage. The panels are made from metal with a durable e-coat finish that protects the fence against rust and damage. It comes with 8 ground anchors that you can use to secure the fencing down outside. This pet fence is available in five different heights: 24″, 30″, 36″, 42″, and 48″. This makes this pet fence a good choice for different types of pets, including small pets, cats, and dogs. While 24″ might be too short for a medium-sized dog, it is perfect for a rabbit. However, this fence is best for pets that weigh 25 pounds or less. The Regalo 192-Inch Super Wide Adjustable Gate and Play Yard, 4-In-1 is a more expensive choice that should only be used inside. However, for the additional money, the Regalo 192-Inch Super Wide Adjustable Gate and Play Yard, 4-In-1 is versatile and aesthetically pleasing. 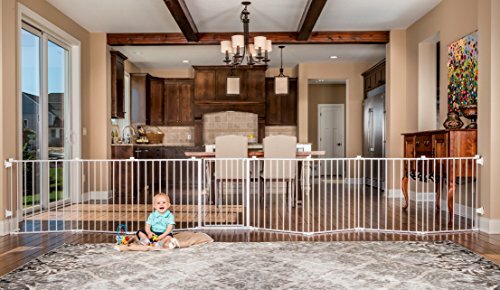 Unlike many other pet fences, you can easily convert this pet fence from a gate to a play pen. At 192 inches wide, this pet fence can easily separate a room into two areas. It is 28 inches tall, which can help contain most breeds of dog or even young children. It folds flat for storage, so you do not need to keep the pet fence up all of the time. There is a walk through door with a safety lock that makes it easy to get from one area to the next. When used as a gate, it can be wall mounted for added security. To convert it to an 8 panel play yard, you can assemble it without any tools. See a popular pet playpen that won’t break your budget. In terms of pet fences that cost less than $50, the IRIS Pet Playpen with Door, 24-Inch is difficult to beat. It is a sturdy pet fence made of durable, heavy-duty plastic that is nice looking. It doesn’t look flimsy like other pet fences in this price range might. Consisting of 4 panels, it has a pet-sized door that makes it easy to let your dog walk into the play area and out of it. It is available in 7 different colors: brown, chrome, green, white, blue moon, dark gray, and garnet red. You can choose the color that best suits your preferences or home decor. In addition, you can purchase a separate mesh roof that is machine washable and keeps your pet safely inside the pen while protecting them from other animals. This exercise pen is 24″ tall and made in the United States. You can add additional interlocking panels to create a larger pet fence with more space for your pets to run around in. It is lightweight and easy to transport or assemble. If you want to opt for an underground pet containment system, the DOGTEK Underground Pet Containment System is a trusted pet fence that can cover up to a 1/2 acre with the included 500 feet of 20 gauge dog fence wire that you’ll need to bury 1″ to 3″ deep. The set comes with either 500 or 1,00 feet of dog fence wire depending on the size of your yard. You also have the option to have one or two receiver collars, depending on how many dogs you have. The collar receiver is waterproof and offers long and short contact points so you can customize the fit based on your pet’s needs. It is recommended for dogs that weigh 20 to 200 pounds. There is a wide range of accessories and replacement parts available online in case you need it. The Paws & Pals Pet Exercise Pen Tube Gate with Door is a standard pet fence with 8 panels and a door constructed from metal that is rust resistant. It even has rounded edges so your pet will stay safe in the pen without hurting themselves on sharp metal edges. While there aren’t too many features that differentiate it from others on this list, it is an affordable option, costing as little as $30. It is constructed from 1/2″ heavy duty tube metal and is easily put up and taken down. It is available in 4 different heights: 24″, 30″, 42″, and 48″. It collapses neatly to enable you to transport it. Most pet owners will need to consider some sort of pet fence at some point in their pet’s lifetime. For dog owners, a pet fence can make it safer for your dog to spend time outside of your home without you having to worry about the dog running away or getting hit by a car. If you don’t own a home or have a yard, an indoor pet gate can restrict your pet from hazards inside your home or make sure he doesn’t go through the trash can when you’re at work. For small pet owners, a pet fence can provide them with more opportunities to interact with their pets. A small pet fence can contain your small pet while you watch him explore a larger area than his cage. You can even use the pet fence outside to enable rabbits and guinea pigs the opportunity to play in the grass. When you travel with pets, special consideration must be given to how you plan to contain your pet while you’re away. A portable pet fence can give your pet a safe and contained space to roam no matter where you go. If you go camping with your small dog, the dog can stretch his legs out unleashed in a portable pet fence. Door. A pet fence with a door makes it easier to let your pet in and out of the pet fence. In pen and gate models, having a door means that you can pass through the gate without climbing over it. Some pet fences have smaller pet doors where you can give your pet access without opening the main door. Comfortable fence receiver. For electric, invisible, or wireless fences, a fence receiver is the collar your pet wears to activate the fence. It may use noise, vibration, or small electric shocks to deter your pet from passing the fence. Since your pet will wear this collar often, it is important that it is comfortable. Levels of correction. 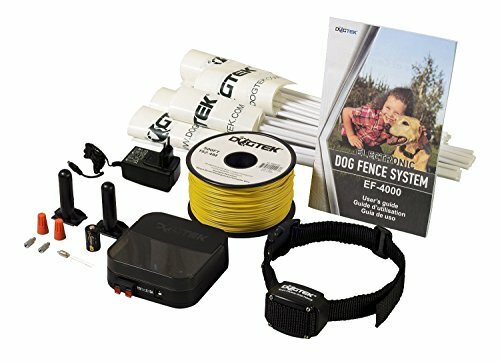 Pet fence receivers that offer different or progressive levels of correction only use the required amount of discipline to get your pet to respond. This means that the strongest vibration or loudest noise will not be used if it isn’t necessary. Foldability. Some pet fences can be folded to be put away when not in use. This doesn’t mean that the fence is necessarily lightweight and portable, just that it can be folded to take up less space. Portability. Portable pet fences can easily be moved and transported to where you need it. Some of the pet fences collapse so you can take them while you travel while others fold on top of each other. Construction materials. Pet fences are made from a wide range of construction materials, including metal, wood, mesh, and polyester. Some of these materials are better suited for certain types of pets. For instance, active dogs may have an easy time getting through mesh fencing. Expandability. Depending on the type of pet fence, some of the pet fences available can be expanded to cover additional surface area or a bigger backyard. Configuration options. Some folding and portable pet fences enable you to have different configurations, such as an L-shape and an octagon, depending on the number of panels. Natural wood and pet-safe finishes. Some pets may bite or lick pet fences, so you want to make sure that whatever the pet fence is made from, it is natural and safe for pets. Assembly. Most pet fences need to be assembled, at least in some way. Make sure that you choose a pet fence with a level of assembly that you’re comfortable with. Some pet fences offer easy assembly. How deep do you bury a dog fence? How deep you’ll need to bury your dog fence depends on what kind of fence that you plan on installing. For underground, in-ground, or remote dog fences, you’ll want to bury the wire for your dog fence no more than 24 inches from the surface. The deeper you bury the fence wire, the closer your receiver will need to be to reach it. For traditional fences made of wood, metal, or composite materials, you should defer to the instructions provided by the fence manufacturer. Dogs can dig beneath or crawl under fences that are too high from the ground. If this is a problem in your yard, there are products you can buy to reduce the chance of your dog getting out. Fences vary widely in terms of cost. In general, purchasing a pet fence will be less expensive than installing a perimeter fence around your entire yard, though the exact savings will depend on the materials you choose. You can purchase an affordable pet fence that is portable for less than $100, where having a perimeter fence installed can cost you more than $3,000. How much do invisible fences cost? While the cost of an invisible pet fence will depend on the features of the fence and the ease of installation, many invisible fences cost between $200 and $300 for the base model. There are additional accessories and installation tools you may need that will add to to the total cost. How do I keep my dog from digging under the fence? Once you install a pet fence, you don’t want your pet to simply dig out from under it to escape. The first step to preventing your dog from digging under your fence is to install your properly. If this doesn’t work, you can try to install landscaping in front of the fence so that there is more of a barrier between your dog and the fence. For permanently installed pet fences, you can also use an L-footer or a concrete footer to prevent digging. We looked at 20 other pet fences. Even though they didn’t make our 5 best pet fences list, they’re the best of the rest and each is still a great option for your dog. The information you’ll need to compare each one is included with the listing. Looking for an affordable pet fence with 8 standard panels? The BestPet 8 Panel Play Pen is a good choice with three height options: 24″, 30″, and 36″. For a heavy-duty fence that features a beautiful finish, consider the BestPet Hammertone Finish Heavy Duty Pet Playpen Dog Exercise Pen. Its 32″ height makes it an ideal height for many breeds. Its 8 panels can be used together or with fewer panels to create different sized play areas. 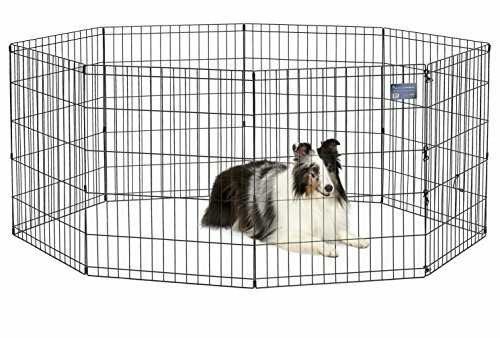 The BestPet Heavy Duty Pet Playpen, 40-inch is a versatile and heavy-duty pet fence with a 1/2″ tube frames and an easy to open door. It is a good choice if you need a tall pet fence that’s expandable. For a customizable and colorful pet fence made from commercial grade plastic, the IRIS Exercise Panel Pet Playpen with Door is an easy to assemble choice. It is available in 9 colors: blue, brown, chrome, gray, green, pink, red, white, and blue moon. For a lightweight plastic option that can’t rust, the IRIS USA, Inc. Iris White Eight Panel Pet Containment Pen with Door is a customizable, expandable, and portable option that’s made in the United States. You can even purchase a two piece add-on to expand the play area of the pet pen. For a versatile pet fence designed for use inside and out, choose the Ollieroo Dog Playpen Exercise Pen Cat Fence. It is a durable pet fence with a black e-coat finish and outdoor stakes that easily folds up for storage and transport. If you have small pets, the Tespo Dog Playpen is an ideal option that features 12 transparent white panels that are 28″ tall. It is easily transported, lightweight, and can be put together without any tools. Another pet fence that’s perfect for small pets is the Tespo Pet Playpen, Small Animal Cage Indoor Portable Yard. 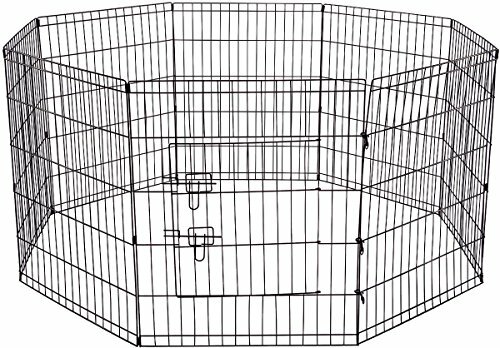 Its open wire panels allow you to customize your pet’s play space, including the ability to add on additional kits and build up the height of the pen. The TMS 24″ Tall 16 Panels Metal Pet Dog Puppy Cat Exercise Fence provides a tremendous amount of surface area for your pet to roam in a variety of configurations. The door latch locks to provide added security, while the ground stakes keep the pet fence in place outside. While its manufacturers claim that it can be used indoors and outdoors, the Yaheetech Metal Pet Dog Puppy Cat Exercise Fence is an ideal choice for pet owners looking to creating an expansive play area for their pets. With your choice of 8 or 16 panels, you can create different configurations to meet your needs. For an in-ground pet fence that’s safe for smaller dogs and cats as light as 8 pounds, the PetSafe Basic In-Ground Fence for Dogs and Cats is an excellent choice. Its lightweight receiver collar is waterproof and adjustable. For pet owners with many dogs, the SportDOG Brand In-Ground Fence System or Contain + Train System is the best choice because you can continue to buy collars to include more dogs. It is easy to install and can cover up to 1 1/3 acres with a single kit. Plus, added features, such as the available remote training system and built-in lightning protector, are nice to have. 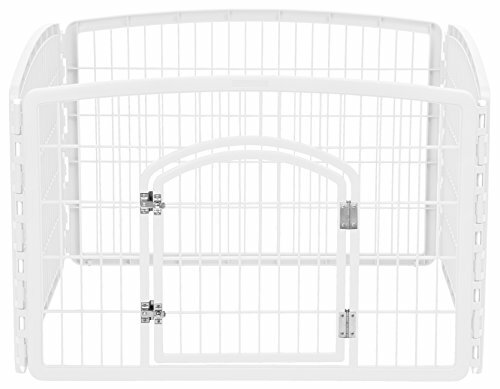 The Carlson Pet Products Lil’ Tuffy Expandable Gate with Small Pet Door is an adjustable steel pet gate for openings that are 26″ to 42″ wide. A convenient small pet door makes it possible for small pets to pass through it, when open, without having to take down the pet gate. For a pet gate that you don’t need to install permanently on a wall, the Foldable, Free-Standing Wooden Pet Gate is a stylish option that’s perfect for apartments. It is available in four beautiful finishes, including dark brown, mahogany, rich espresso, and white. For pets that won’t jump over it, Four Paws Folding Panel Gate is made from solid wood with a natural finish. It doesn’t require any assembly and does not need to be affixed to the wall. For a sturdy freestanding gate, the Richell Wood Freestanding Pet Gate is an easy choice with three finishes: Autumn Matte, White, and Wood, Autumn Matte Finish. It is available in a large and small size. For the ultimate wireless pet fence, the PetSafe Stay + Play Wireless Fence has a lot of features, including five levels of correction, ergonomic rechargeable collars, easy set up, and the ability to add however many collars you need. Since the set up process is so quick, it is a smart choice for frequent travelers. The PetSafe Wireless Fence Pet Containment System combines some of the best features of more expensive wireless systems into an affordable wireless pet fence. It provides up for 1/2 acre in coverage and can operate in tone-only mode, if wanted. The PetSafe Wireless Fence (PIF-300) with 2 Extra Battery Packs provides enough coverage for a circular area up to 1/2 acre in diameter. Its adjustable levels of correction and a warning beep mean that you’ll only have to use the level of correction appropriate for your pet. Although it is one of the most expensive pet fences you can buy, the Wireless Pet Containment System by PetSafe is the full featured wireless pet fence of choice for homes with many dogs. It comes with up to 8 collars that work on 3/4 of an acre, though you can add as many collars as you’d like.